Oh! doesn’t everyone love cake!? Here we go with another winner from Sky High Cakes. It can be made with regular yellow cornmeal, but isn’t it prettier with blue? Well, blue is a tad harder to find. I searched high and low, in every grocery store, in my hispanic neighborhood. Not until I asked John to pick some up in New Mexico did I finally find it. Oh well, at least I know now where to get it next time. This cake really does not need the white frosting at all. It should be served/made with just Dulce de Leche between the layers. And I have it, at my beck and call, thanks to Nestle. One more interesting thing about the cake is that it has a teaspoon of Chile Arbol – which lends an interesting afterthought to each bite. optional to add a couple drops of red and blue food coloring – this gave it a more pronounced blue coloring (blue alone made it green). Mix all ingredients together well with a whisk. 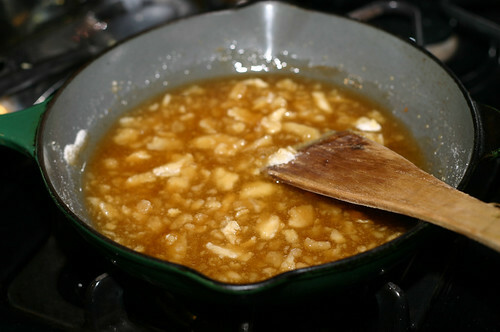 With an electric mixer in a clean bowl beat until stiff peaks form. I found it easier to whip these up 4 whites at a time. You DO NOT want to add any runny extras, from the bottom of the bowl, to your cake! (Read comments down below about dense cakes and you’ll understand my urgency here!). 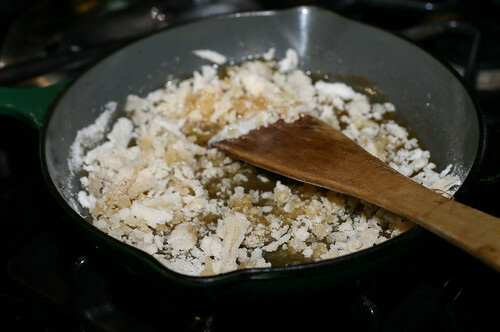 Fold in a quarter of the stiff egg whites, at a time, into your batter slowly and gently. 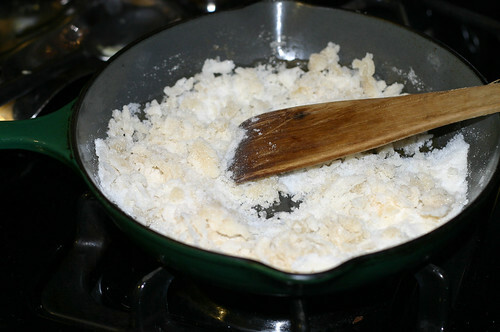 Once incorporated pour equal amounts into three greased and floured 8″ cake pans. Bake at 350 for 20-25 minutes or until the center of the cake, when stuck with a toothpick, comes out clean and the edges pull away from the side of the pan. Cool completely and “frost” Dulce de Leche between each layer. If you want the white frosting – a simple Buttercream one will do: 1 Cup Butter whipped up with 1 tsp Vanilla and 4-5 Cups Powdered Sugar. But as I mentioned before, this cake really only needs the Dulce de Leche. 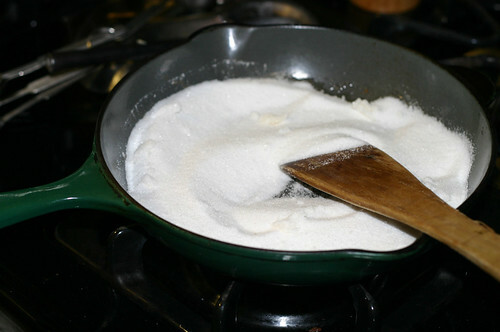 continue stirring and turn temperature to medium low – you DO NOT want to burn the sugar! SLOW YOUR ROLL! Dump onto a silpat liner and spread out quickly before it hardens. Once completely cooled, lift off liner and break into pieces. If you don’t have a liner be sure to grease or butter your pan WELL! 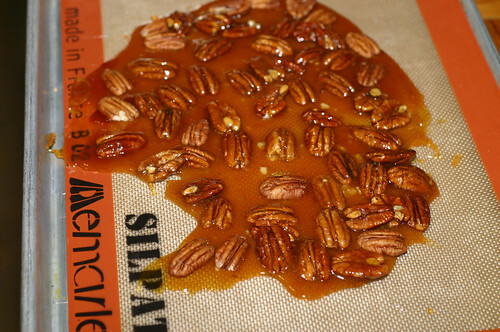 Love the brittle on top! 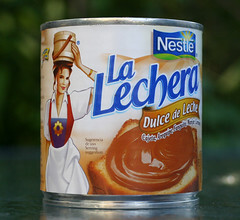 And with dulce de leche? Yum! Outrageous looking. I’m sure it tastes as good as it looks. WOW what an unusual cake. Can’t imagine the how flavor combos taste. Would like to try this one however, haven’t found blue cornmeal here as of yet. And so pretty too! I could never make something so gorgeous looking! this looks incredible! i love the colors of the cake itself! This is something different and unique. I can imagine the flavors are just outstanding. Mary, you’re the Queen of Cakes! Here you go with another great recipe! I like the tutorial on the brittle, too. I never would have thought to make it with just sugar and nuts! 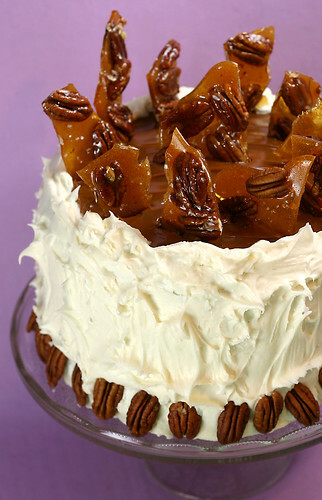 Outstanding – the brittle is grand – I love the idea that each bite has an “after thought.” You do make the grandest cakes! so unique! and looks delicious! What unusual ingredients for a cake. It’s hard to believe that it works, but your picture speaks for itself. It seems like a perfect cake for here in Texas, both because of the ingredients and because it is BIG. 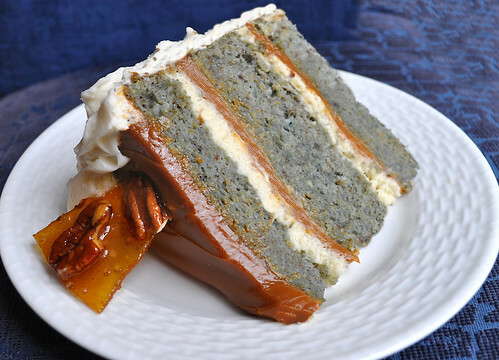 I love using dulce de leche in between the cake layers — delicious! This is so unique! I just saw some blue cornmeal at the store, so I will have to give it a try! MMMM….I am always wondering about substituting blue cornmeal for yellow. Now I know it can be done with beautiful results. Thanks! Wow! Cornmeal, chiles and caramel!?! You have knocked me out once again! Wow Mary! i made the blue cornmeal cake last week and it was the dryest, most dense cake i have ever put together/tasted. Oh Whitney – what a disappointment – I’m so sorry! I have a few scenarios that may have played a part. The first time I made one of Sky High cakes the batter was very similar in that you had to fold in egg whites – I didn’t put much thought into it and had a lot of runny egg whites at the bottom of the stiff egg whites and poured the whole thing in, folded it in to incorporate – shoved them in the oven and CRAP if they weren’t the most dense cakes on earth! I was pissed – how could this happen – to ME!? I threw them out and blamed the recipe. UNTIL this recipe – I thought to myself “self” here is the same type of cake – follow the directions carefully – I only had a tiny bit of runny egg whites and did the same thing – and had the same results – threw them out and made them again immediately and beat the whites in two separate batches so there was nothing running anywhere – and VOILA – I had success! Thanks for sharing this recipe on line! Chop 1/2 cup of the pecans and set aside for decoration. I had used the whole 3/4 of a cup inside my cake last night. Also from past experience egg to whites whipped too stiff can cause a poor end result. I added a pinch of cream of tarter help whip mine. good morning Elyse – yes, I skipped that part because I love pecans and put them ALL in my cake – both times. I think next time I’ll even throw in a full cup – YUM! I try hard not to copy recipes verbatim, and give the reader what I actually did in the kitchen to get the final product. I think/hope I avoid any copy-right issues that way. If I recall, my dense problem was from under-whipping too many whites all at once – the second time was the charm. Which seems to be the case more often than not with her cakes. But as I progress and get to know her style and quirks a little better I’ve had more luck (Sky High Chai). Thanks for the Cream of Tartar tip – I’ll use it for the next go-around. I do hope you’ll try it again – the flavor was subtle, different and truly one of my favorite Sky High cakes thus far. Thanks trying again this weekend! So glad I tried again – great flavor and texture! WOO-HOO!!! I am too and even more excited that you came back to let me know!